This chart covers the week commencing November 5th to November 11th. As Fortnite continues to lead the popular games chart, Ninja continues to lead the popular creators chart. The streamer topped up his views by another 38 per cent this week. Second place this week goes to Twitch channel ESL_CSGO, providing coverage of the recent IEM CS:GO tournament in Chicago. That channel saw a meteoric 3249 per cent rise in views during the event. 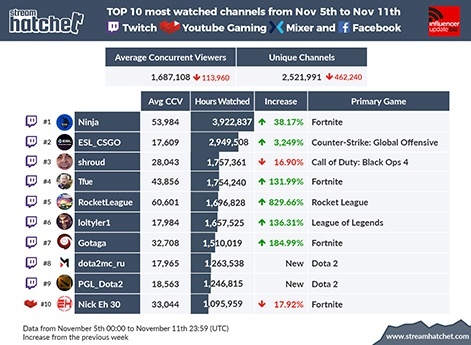 Twitch streamer Shroud takes third despite a 16 per cent drop in views. Fortnite streamer Tfue shoots up to fourth with a 131 per cent rise in views. The official Rocket League Twitch channel is having a successful week in fifth place with an 829 per cent increase in views. The channel is providing coverage of the Rocket League Season 6 championship. League of Legends streamer loltyler1 is a new entry at six this week with a 136 per cent increase in views. He's closeely followed by Fortnite streamer Gotaga, who's experienced a 184 per cent increase this week. Dota2mc_ru and PGL_Dota2 are both new entries to the chart also. Both are Dota focused Twitch channels providing coverage of the Kuala Lumpur Major. YouTube channel Nick Eh 30 is bringing up the rear despite a 17 per cent decrease in views this week. YouTube channel Challenger TV is leading the trending by followers chart this week. The channel provides coverage of various esports tournaments. Other entries this week include YouTuber Danoninho, a relatively small Brazilian streamer, and Symfuhny, a Fortnite Twitch streamer that has a YouTube channel on the side. 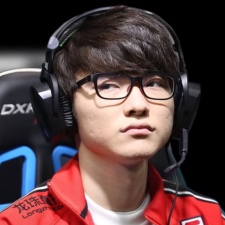 Professional gamer Faker (main image) has also made an appearance this week. 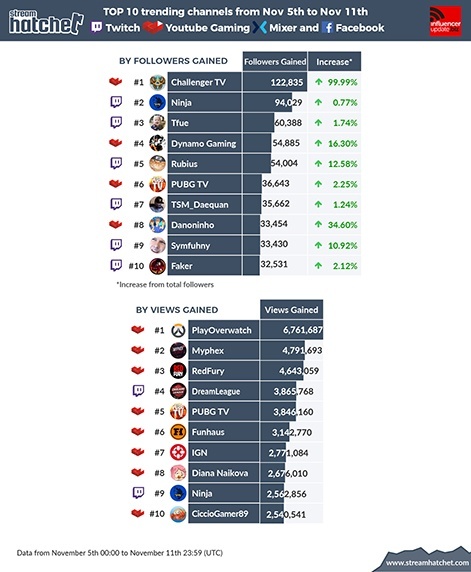 The League of Legends icon's Twitch channel is closing the trending by followers chart. Overwatch's official YouTube is leading the views chart this week. The unveiling of new playable character Ashe saw Overwatch fans flock to the channel. Fortnite YouTube channel Myphex is in second place after leading the chart last week. Other entries this week include YouTube gaming channel RedFury, media outlet IGN, and of course, everyone's favourite Fortnite boy - Ninja.